How do active, inactive, and deleted users affect reports and performance views? To avoid invite emails arriving in Spam folders, request that your IT department add the mypurecloud.com domain to their trusted sites list. * Having an assigned manager is required for using hierarchy views. When you create new users, PureCloud automatically sets their status as active whether you send the invitation now or later. If you choose to send invitations to new users later and manually set their status to inactive, when you send the invitations PureCloud automatically changes their status to active. Under People and Permissions, click People. Click Add Person. The Add People to the Organization dialog box opens. Complete the mandatory Name and Email fields. (Optional) Enter additional information by clicking Optional Fields. Note: The Manager field is optional but recommended. PureCloud uses manager assignments to create hierarchy views. Under Assign Queues, begin typing the first few letters of the desired queue. Select it from the list. Repeat steps a-b for each additional queue to which to add the person. 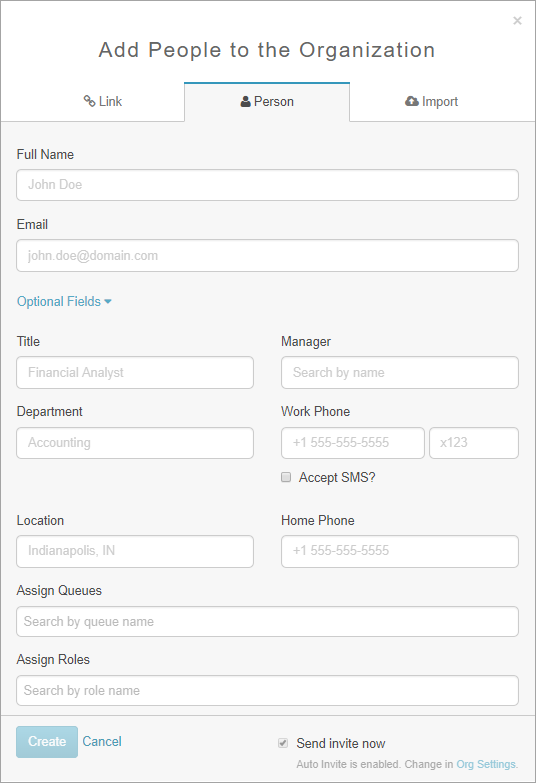 Under Assign Roles, begin typing the first few letters of the desired role. Repeat steps a-b for each additional role to assign. Send the invite automatically by selecting Send invite now. Note: The people you add cannot join PureCloud until they receive an invite. If you don’t do this now, remember to do it later.